Rotisserie chicken recipe. The perfect campground meal. You must try this rotisserie chicken recipe. For a camping trip meal you and your guests will never forget you really need to give this a go. So you are planning a weekend camping trip to the campground at the lake or you are staying at home this weekend, either way this is a tasty and easy rotisserie chicken recipes. Preheat the grille until it is 500 F. Season the inside of the chicken with the pinch of salt. 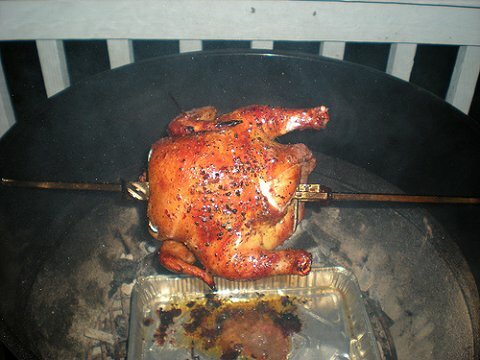 When the heat is at 500F place the rotisserie with the chicken on it on the grille and cook it for 10 minutes. During this time, in a bowl mix the butter or oil, the salt and pepper and paprika. Once the 10 minutes are up turn down the heat to medium or 325F and baste with the mixture. Baste every 20 minutes. You need to cook it until the temperature reaches 180F inside the thigh. Check it with the meat thermometer. It is very important to let it stand once it is done for at least 20 minutes. This will allow the juices to equally spread properly within the chicken. This is a wonderful Rotisserie chicken recipes. Now here is a recipe that you can cook at home or in a BBQ grille at home or at the campground. Use two bowls. In one mix the salt, pepper, and cheese. In the other bowl beat the egg thoroughly. Dip the chicken in the egg. Roll it in the cheese. Place the legs in a pan and bake them for 45 minutes at 400F or until nicely brown. You might want to spice things up by adding a little garlic powder and onion powder and a little flour with the cheese. You can put the dry ingredients in a ziplock bag and then add the egged chicken and shake it well. Here’s a tip. Sometimes the chicken may not have been drained of blood when you buy it. Try this. Soak the chicken in ¼ cup of salt for at least an hour and this should draw it out. Here is a nice spicy chicken and chili pepper combo that blends well with a creamy soup mixture that will delight your taste buds when rolled up in flour tortillas and baked with a nice creamy cheese on top. 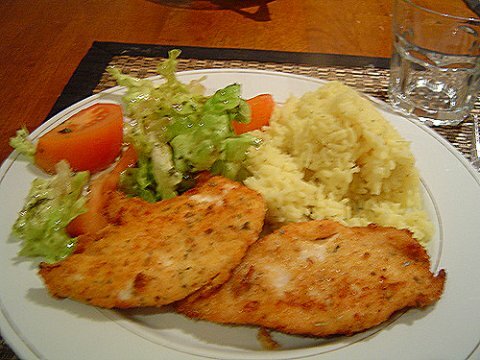 Easy and fun chicken recipe. In a medium saucepan melt the margarine over medium heat and add onion and chili powder. Sauté until tender. Stir in the chicken, chili peppers and two tablespoons of the soup mixture. Cook and stir until heated thoroughly. In a 9X13 inch baking dish spread 1/5 cup of the soup mixture and spoon ¼ cup of the chicken mixture along the center of each tortilla. After rolling up the tortillas place them seam side down in the baking dish. Ease the remaining soup mixture around and on top and sprinkle with the cheese. Bake for 25 minutes at 350 F until lightly browned and bubbly. We never did find a baked chicken rice recipe but we tried quick shredded chicken recipes and they were great. Nice consistency. You only need to look up boneless chicken breast recipe on the internet to see just how many different recipes there are out there. One of the best fried chicken recipe you will find is churches chicken. You should get there to the outlet early in the day as they make the chicken quite awhile before hand. I personally find the Indian chicken recipes are a little too spicy for my taste.